Shakespeare has meant many things to the hundreds of readers, scholars, and students who have read him for pleasure or to sample his breathtakingly profound analysis and commentary on human behaviour and the central dilemma of life immortalised in sentences such as, ‘ To be or not to be….’ But Shakespeare has other uses too and in this article I am going to argue that he has now begun to have a universal appeal totally different from what his commentators have in the past quite rightly credited him with. This appeal lies in the relevance he has in the lives of Indian students of the 21st century, a relevance they themselves bestow on him and perhaps completely different from the meaning his readers were trained to have in earlier times. I am an English teacher in an IB (International Baccalaureate) school – one of the most challenging and interesting institutions to be in today’s educational scenario. I say this with great humility, because I understand, as anybody would, that the IB can appear to be irrelevant to the Indian system. However, upon closer consideration, I think it is of the greatest value as a means of expanding that wonderfully plastic thing – the human mind – to its limits, to have the opportunity to study and reflect on literature through the ages, across borders, using judgment and critical ability to think and write about the value that the greatest writers of the world have centuries after their time. Of course, I realize that to praise Shakespeare is merely to state the obvious and then risk sounding crass and condescending. However, in this brief exposition, I want to share the experience I have had teaching Shakespeare to 21st century students. The two Shakespeare texts I have taught – rather, we have explored together in class – in the last three years have been Othello and Macbeth. Why did I choose tragedies? This is a question I have often been asked, especially given that my class is on the average 16 – 17 years old. The answer to this is reasonably clear in my mind – Shakespearean tragedy, modelled as it is on Greek tragedy, has all the components of drama in its most pristine form. There is a lot that can be said and discussed in the form and I think one of the more important skills for this age group is the ability to discuss and debate. Tragedy, as a form, is replete with opportunities for doing this. Before I go any further, let me outline what I want for my students as they leave school and go out into the world. A capacity to read and understand, the ability to polish one’s critical judgment, which means the capability to be objective (‘this is.’ rather than ‘I like……….’) along with the capacity to discern the larger issues in the texts. All this and one more thing – linguistic fluency, requiring precision and accuracy. The texts I choose must fit the demands I make of my students. These are the goals. How does Shakespeare and tragedy teach these things? For a start, drama as a genre is in itself an eclectic mix of on-stage dynamism and audience/reader participation. The dynamism comes from the interplay of the four components, as I see it, of any literary work: plot, structure, character, and language. In Shakespeare, more than in any other playwright, the four intermingle seamlessly. In both Othello and Macbeth, the plot has for its basic theme the conflict between the forces of good and evil, which exists everywhere in the universe, within and without. The Elizabethan concept of the microcosm (human beings) reflecting and mirroring the macrocosm (the universal impetus that pushes human life) is everywhere present. In Othello, this force is represented by that most perfect of villains, if there be such a paradox, Iago. The character of Iago is unparalleled, even in Shakespeare’s vast repertoire: indeed, I think he has created a world within a world in his characterization- in his evil, he is completely without a second. His manipulative tactics, his understanding of those around him, his swift and total changes of personality which presuppose changes of expression, of tone, voice, of register while delivering the lines are a masterstrokes in the creation of drama. 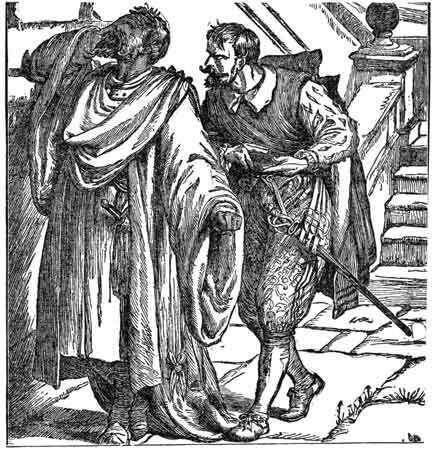 The manner in which Iago delivers his lines when planting the first seeds of doubt in Othello’s mind – in short, sharp, staccato bursts, resembling the plunging of a rapier into the breast to draw sudden spurts of blood, sending Othello into a violent flurry of miserable suspicion and grief, or when he persuades Roderigo to pursue Desdemona by discouraging, rather than encouraging, words, using the dramatic device of paradox to its fullest are two examples of Shakespeare’s genius with characterization. Initiating a discussion of this in class is one of the most interesting experiences a teacher can have. Appreciation of the choices a writer makes is possible only if the reader can choose her response, because it is neither necessary nor possible or even desirable, for a universal or prescribed response to a writer of such cosmic proportions. As a play, Othello has had electrifying reactions, which is one form of response (possibly the most spontaneous), in my classroom. Students who are old enough to understand relationships are vociferous in their dislike and disdain of Othello’s weakness rather than Iago’s machinations. They also question the definition of love as expounded by Shakespeare in this play. If it is love, then why could Othello not be more direct? This is personal response. The idea that tragedy does not, as the philosopher Wittgenstein said, lie in death but in the inexorable workings of events which we are powerless to prevent, emerges only after much discussion. Then why did he do it? Classroom exposition will later reveal the complete comprehension Shakespeare had of human nature. The three witches are none other than Macbeth’s deepest desires, the subconscious which operates in a wild, uncontrolled manner even in the breasts of the most refined human beings. 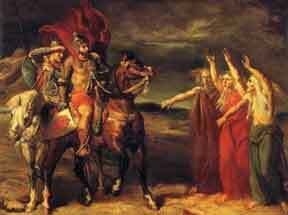 To perceive that sacrificing one’s integrity results in tragedy worse than death – the loss of one’s dearest and most intimate human relationship in the case of Lady Macbeth and in the case of Macbeth himself in losing his good name, which is as profound a loss in a hero as the loss of life. The structure of the plays gives rise to spirited exchanges – playwrights structure their plays in different ways to realize their aims- because of the closeness to Greek tragedy. The first act sets out the situations through a series of incidents which are enacted by the characters. Thus, we get at the very outset an understanding of the main characters of the play (though in Othello, exceptionally, Othello is introduced later in the act). Through the language used, the reader/audience is made aware of the present and the past. The second act exposes the choices the main characters may have, while in the third act, complications arise and chaos is the result. We begin having a glimpse into what the future might hold. The fourth act sees a deepening of the maelstrom about to enter and destroy the hero, whose fall is about to be as low as his rise was high, all on account of his fatal flaw, and resolution and catharsis mark the fifth act. This structure is not arbitrary: it readies the reader for the events which, while causing grief, also satisfies the sense of justice that is innate in human nature. Chronologically and philosophically, the life of the play, brought to fruition through the lives and actions of its characters, comes to an end, thus taking us back again into the past by becoming the past. The language of Shakespeare is perhaps the hardest component of all to make comprehensible to 17 year-olds. There is so little recreational reading done today that linguistic challenges, which may have been instantly accessible to an earlier generation of students, abound. The preoccupation with ‘iambic pentameter’ without quite understanding what it means is tough to dislodge. Deeper attempts have to be made to make language easier. I have tried in this article to show how, despite the classicism of Shakespeare’s style, the strangeness of his subject matter to today’s student, and the historical, political, and chronological distance between his works and today’s scholarship, he still remains as strongly relevant as he ever was to preceding generations of readers and students, albeit for differing reasons. I would like to assert that his contemporariness lies in his adaptability to suit his readers’ purpose in coming to him, whatever they may be – to experience the sublime quality of his language, to understand his times, to learn to fathom the manifold mysteries of human nature, to realize for oneself the cliché that human nature never changes – all these and more. Reading Shakespeare together in class is not anachronistic, as is supposed by today’s syllabus pundits. It is one of those rites de passage from childhood to adulthood, encapsulated in the form of reading experiences where rich and beautiful language expresses that which is real and true. The author has been an English teacher in both colleges and schools. At present she is the Head of the Department of English, M Ct M Chidambaram Chettyar International School, Chennai. She is a published author of a work of fiction called The Cousins, as well as being the Editor of the Learning Curve published by the Azim Premji Foundation, Bengaluru. She can be reached at prema.viswam@gmail.com.